(CNN) -- Boxing idol Manny Pacquiao returned to the Philippines early Friday despite a request from Manila that he delay his hero's return as a precaution against the spread of swine flu from the United States. Manny 'Pacman' Pacquiao arrives in Manila on Friday. A low-key welcome that included three of his four children greeted the 30-year-old boxer at Manila International Airport. A homecoming parade initially planned for Friday has been moved by the Philippine government to Monday, which President Gloria Macapagal-Arroyo declared "Manny Day." 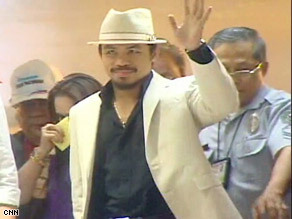 Pacquiao returned to Manila, but did not go into quarantine, although the large public celebration was delayed. He found boxing as a way to lift himself to fame and riches, yet he remains self-deprecating outside of the ring.